I love to travel and especially around the UK. There are so many places to go and things to discover that you can end up almost anywhere and have a good time. 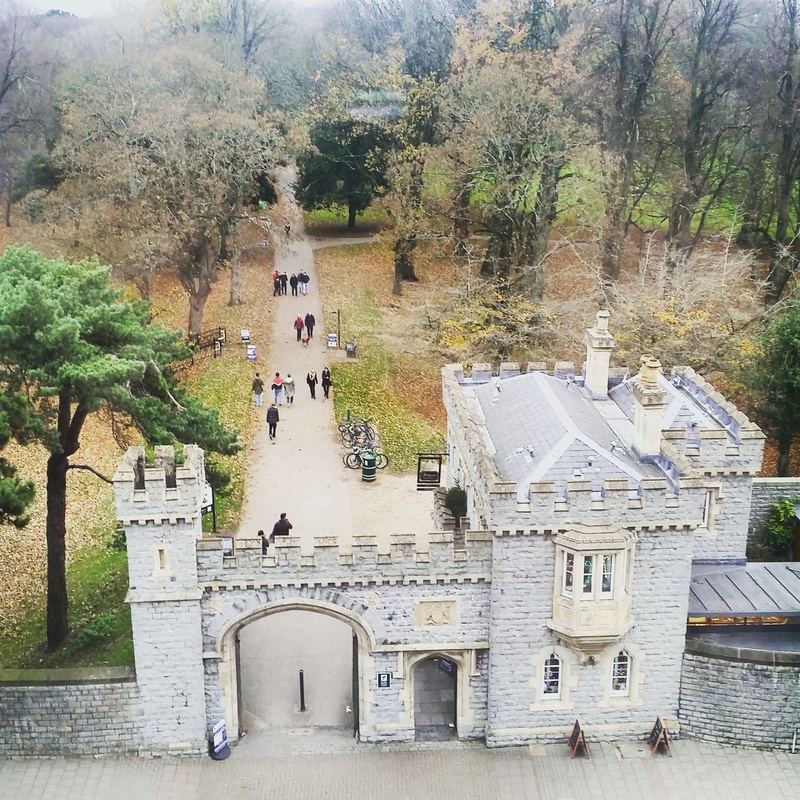 But this weekend my partner and I had a reason to leave gloomy grey surroundings of London, hop on a coach and travel to Cardiff; a PHD event at the National Museum of Wales that my partner wanted to attend to find out more about how to apply for funding and to meet with some representatives from certain institutions. Due to work restraints on my part and my partner having a gig by The Damned in Brixton on the Saturday we decided to head off on the Sunday morning, have the day to ourselves and then do our own individual thing on Monday before returning to London once more. We originally looked at AirBnB places but we left booking quite late and the ones remaining had £15 cleaning fees for one night so instead we opted for the Holiday Inn by Bute Park. Located in the centre of Cardiff it was just a short walk from the coach drop off point as well as being near to a lot of shops, restaurants and most importantly the museum my partner would be visiting. Reviews on TripAdvisor were pretty mixed and did make me a little nervous that the room would be of poor quality or the breakfast would be a disappointment but on arrival it was okay and everything went smoothly. The staff in reception were lovely, the lobby was clean and several people were sat in the hotel bar enjoying a drink or having a meeting. We were told all the usual information about breakfast time and how to locate our room and were free to head off in one of two working lifts to the fifth floor. After navigating our way down the corridors we found ourselves at the front of the hotel that overlooks the main road and the park. The traffic noise was noticable but I could imagine that being better than if you were placed at the back with a match happening in the Principality stadium located right next door. The room was not the largest but it did have all the requirements, once we had located the kettle inside the wardrobe, and was of a reasonable temperature. The bedsheets were clean and well arranged on the bed with the towels in the bathroom carefully put on the rails. After dropping off our stuff for an evening out, more on that tomorrow, we returned to the room and watched the usual Sunday night TV (Planet Earth II) and noticed the TV had a little clock function in the bottom corner rather than leaving you without a clock as many hotel rooms do. But the TV and bed were in slightly strange locations as the TV was mounted on the wall ahead of the bed but on the right hand side meaning the person on the left struggled to see the screen without straining their neck. It looked like the bed once used to be more central in the room as it was rammed up against one bedside table, with little room to walk between the bed and the wall, and a huge gap on the other side but the current positioning was illogical for the only feature point in the room. Trying to get to sleep and remain asleep proved a little more challenging as the pillows were rather large and even just the one left us feeling that our necks were cranked on too much of an angle and I would certainly recommend the hypo-allergenic ones as they may well be a little more managable. Neither of us woke up feeling particularly refreshed and both had slightly aching backs from our unfortunate neck positioning but the beds themselves were no worse than sleeping in our own bed. But waking up meant it was time to try out the shower and head down for breakfast. My partner was rather unamused that instead of shower gel they provided you with a bar of soap and as a result decided to use some of the bath foam instead (in fairness to him the soap had a strong and not pleasing smell of aloe vera) but the showering process otherwise went smoothly. The bathroom itself looked a little tired with the odd replaced tile that did not line up with existing ones, signs of wear and tear and a door that did not shut particularly well. Whilst I did not use it the bath was bigger than many in budget hotels and knowing I could at least sit in it if I wanted was good enough for me. 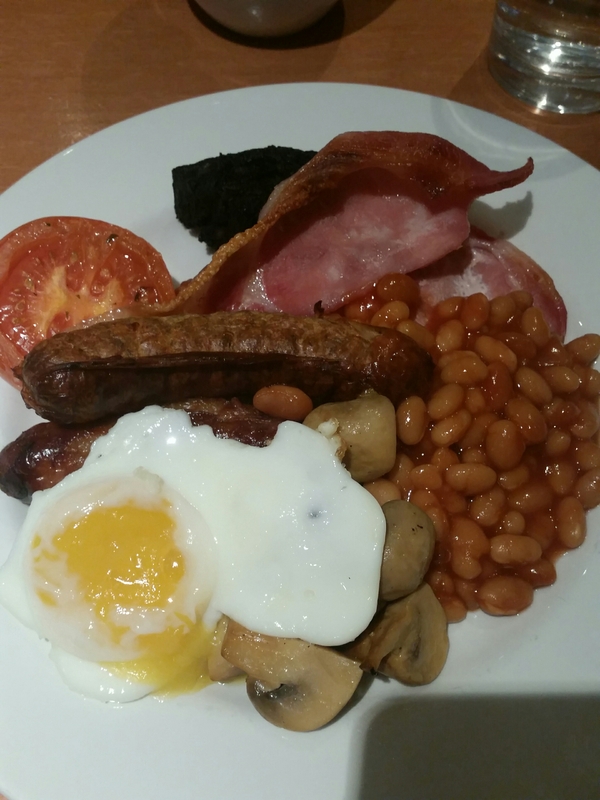 We paid for breakfast in advance with our room cost and it worked out at just a few pounds per person to enjoy a buffet breakfast in the hotel dining room so we just handed down, provided the room number and got shown to a seat without any hassle of adding the fee to the room card. They asked if we wanted tea or coffee and proceeded to make it for us whilst we headed off to select some juice and get breakfast. I first went to the cooked breakfast section and found the usual generic items, though I was surprised to see black pudding, and after looking I went for the slightly overcooked fried egg instead of the rather runny looking scrambled egg *gip*. There were two different types of sausage and the paler one that had herbs running through it was the better but the first one was tasty enough too. Nothing I picked up was horrible and I gobbled it all up although it could have done with some toast or sauce but they were in other sections of the buffet! 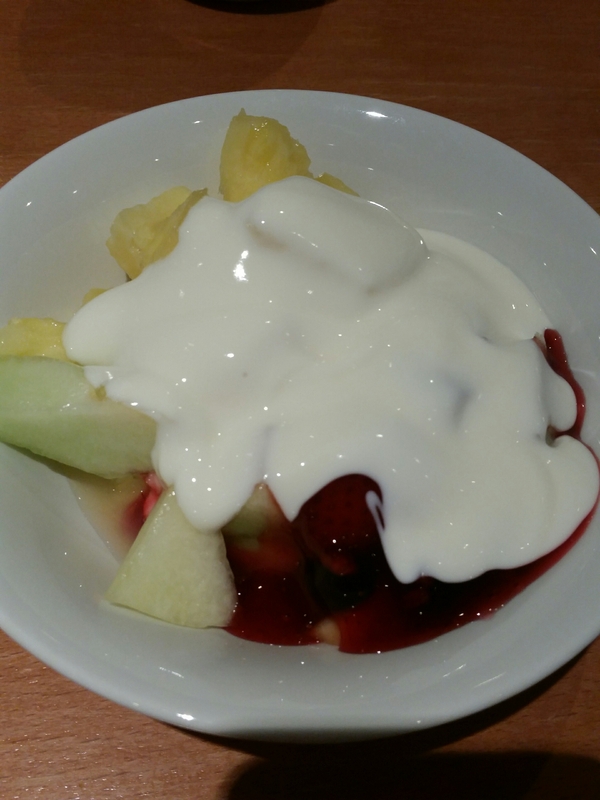 To balance the unhealthy feeling of the cooled breakfast and knowing we had a long day ahead of us I opted for some fruit and yoghurt as well. This bowl consisted of a berry compote which tasted fresh and delightful and a variety of other fruits that make up a mixed salad. The orange segments were rather bitter and even the yoghurt did not soften them very well. My partner and I had a debate about whether some chunks were grapefruit or pineapple as they rather lacked flavour but the conclusion was grapefruit. Tasty enough but despite trying to drain all the fruit juice off from each section before putting it in my bowl I still ended up with a puddle of the stuff that made my yoghurt unhappy. By this point I am pretty much full but there was pastry, cheese and ham hanging around; my weakness. So my partner got this plate for us to share and I went about nibbling on it. 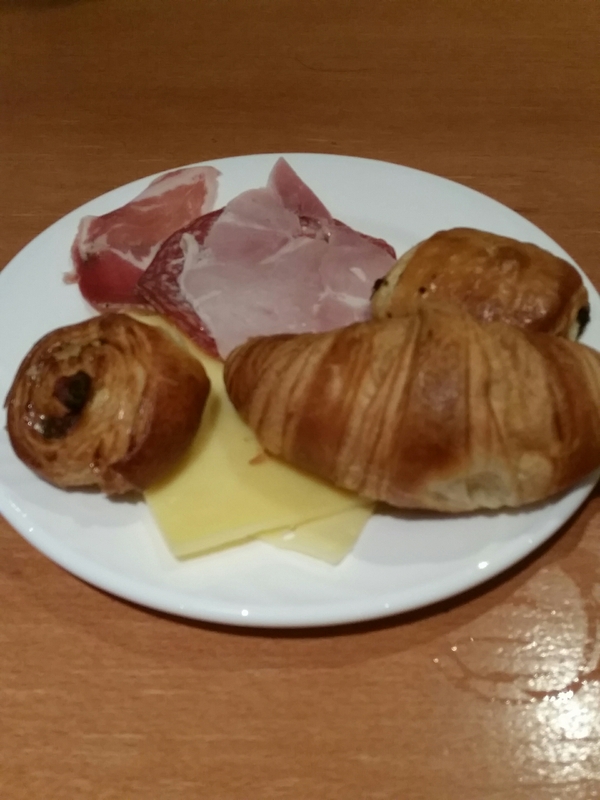 The croissant was good as it was buttery, soft and flaky but you could tell the cheese had been sitting outside the fridge not just whilst at the buffet but in the kitchen too as it had gone from its creamy soft state to a more rubbery and more noticeably ‘cheesy’ one. Overall the hotel, room (with its three large mirrors dotted around) and breakfast was okay and if I was to return to Cardiff it would be amongst my considerations of where to stay (providing there was not a rugby match scheduled) but with the price being fairly average I would consider other central options as well. Everything did feel a little dated and like it could do with a freshen up; old marks on the paint, a cracked skirting board, a wobbly desk and the previously mentioned half replaced tiles. Apparently a modernisation is planned though so I would love to know what a new look Holiday Inn appears like and if they provide any additional services to the ones on offer in Cardiff City Centre. Have you ever stayed in this hotel or a Holiday Inn? What did you think? This entry was posted in Food and Drink, Lifestyle, My Life and tagged bathroom, bed, blogmas, breakfast, business, business trip, cardiff, day trip, Drink, eat, food, food blog, food blogger, food bloggers, friendly, fun, getaway, holiday inn, hotel, hotel review, lblog, lblogger, lbloggers, leisure, life, Lifestyle, lifestyle blog, lifestyle blogger, lifestyle bloggers, location, room, service, travel, travel blog, travel blogger, travel bloggers, vlogmas, wales. Bookmark the permalink.